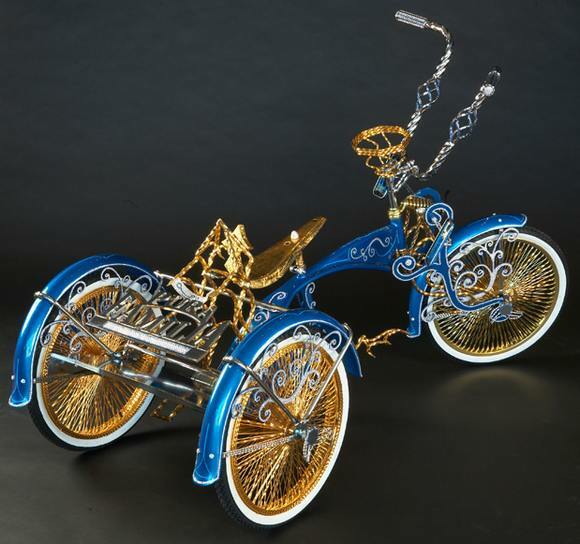 A lowrider bicycle is a highly customized bike with stylings inspired by lowrider cars. 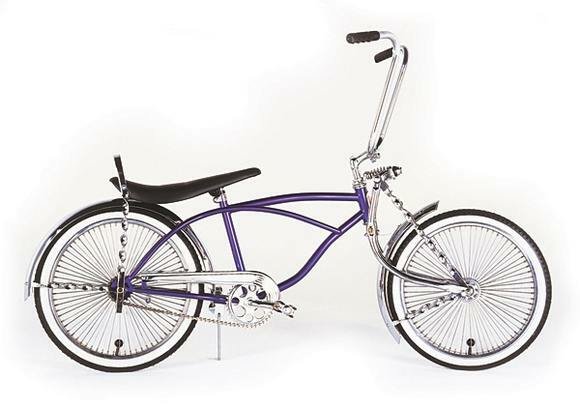 These bikes often feature a long, curved banana seat with a sissy bar and very tall upward-swept handlebarsknown as apehangers. 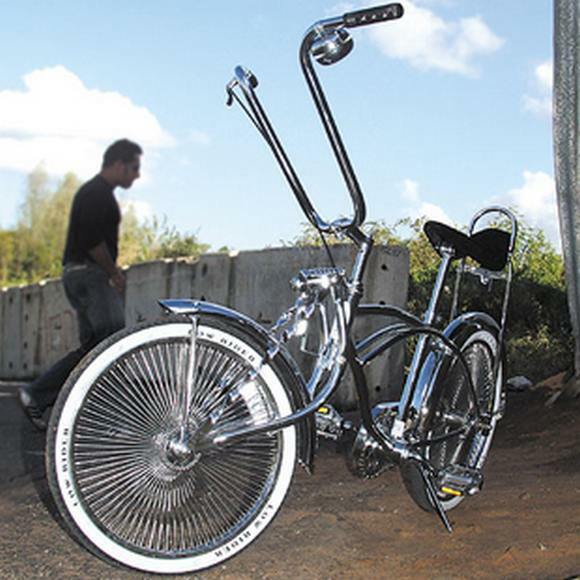 Excessive chrome, overspoked wheels and velvet are common accessories to these custom bicycles.Lowrider bikes first appeared in the 1960s in America. 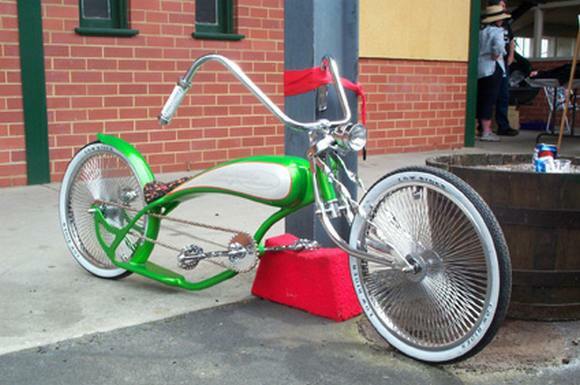 It was started by ‘Custom King’ Sean Johnson who customized automobiles. 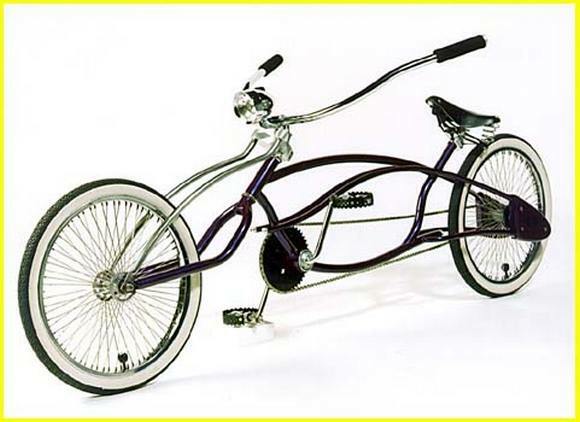 Kids would copy his work on their bikes usually using common muscle bicycles, allowing those who were too young to drive a car to have a custom vehicle. 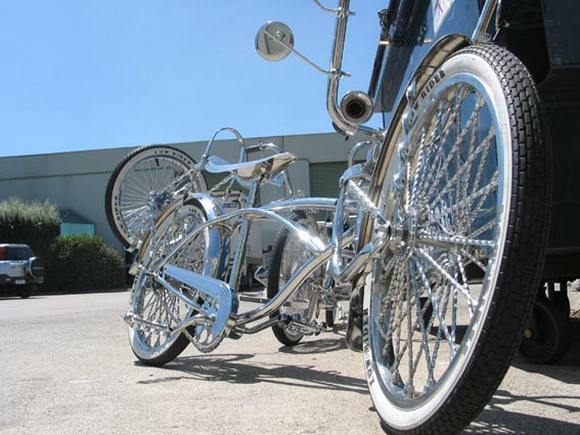 Some basic or classic characteristics of a lowrider bike are: Baby Daytons (like the car rims, they are overspoked and do not cross over each other) with white-wall tyres. 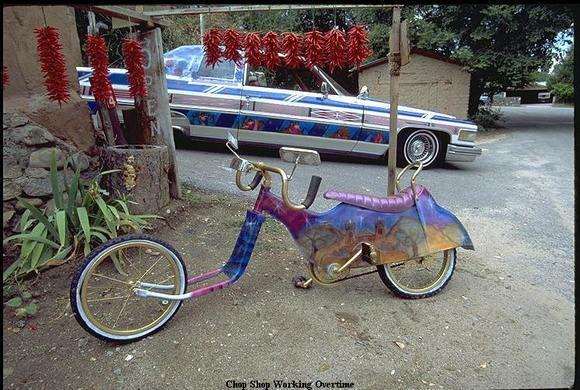 Banana Seats, usually custom upholstery and a customized sissy bar. 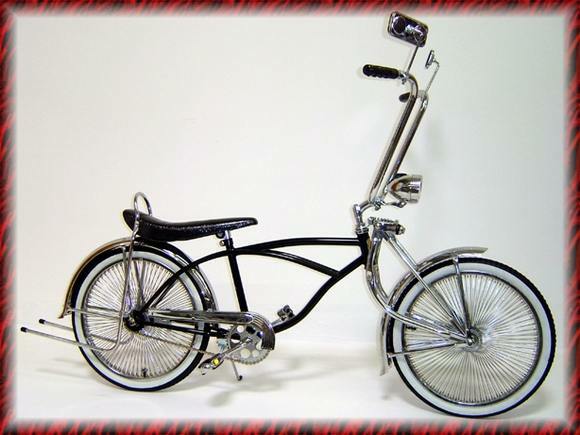 Ape or Schwinn type handlebars. Old school spring action suspension for the front forks known as “springer forks”. 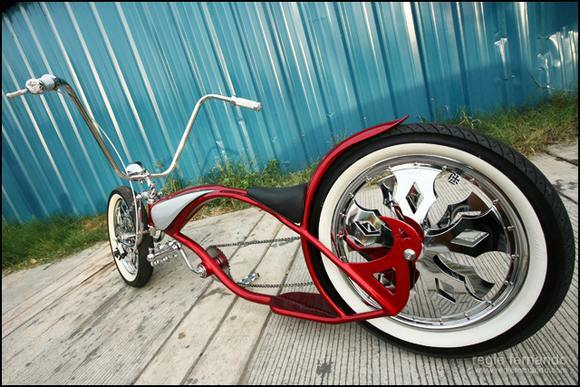 Fenders both front and back. 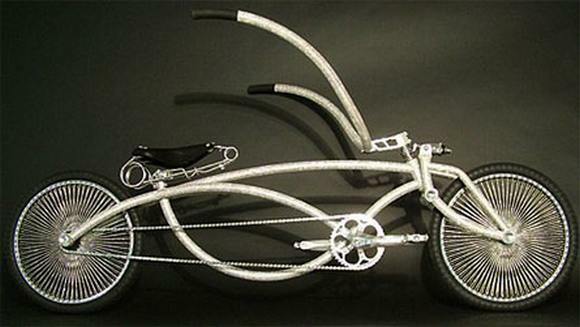 Sometimes a chain steering wheel is attached. Most accessories are highly polished chrome, however gold is also used for added flare though for economical reasons chrome is the standard. Me and my friend ws signwere fighting about an problem similar to this! Now I know that I has been appropriate. lol! Thanks for the information you post. Your blog is good! 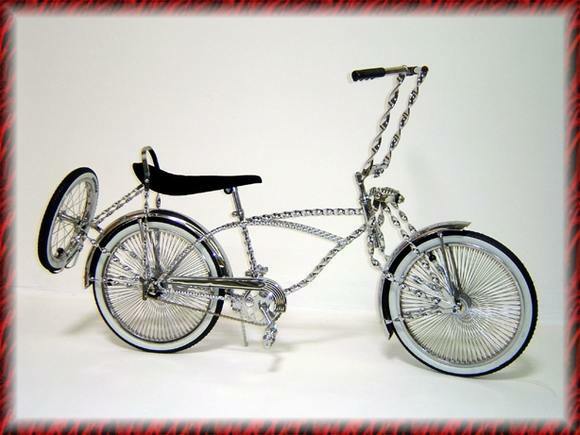 I found it on Yahoo search. I’d like to visit here again, Have a nice day! Just wanted to say th is blog site is in my most effective weblog l ist on #46. 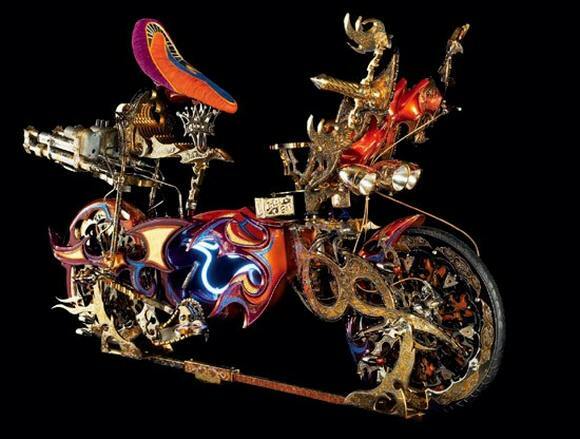 Sweet internet site , super pattern as well as character , rattling purify as well as operate pleasant. This is very stimulating work you have written for us. Some people need to be guided that these things can ensue to anyone. You have revealed to me a better outlook now. Hey there, You have performed a fantastic job. I?ll definitely digg it and individually recommend to my friends. I am confident they will be benefited from this web site.